We are manufacturer and supplier of Water Level Controller. • Pump protection against high voltage and low voltage. • Specially designed sensors that are plastic molded, corrosion resistant, non-conductive, low power and safe for sensing levels in the tanks. • Automatic switch for switching common society lights or loads as per the time set. Our three phase water level controller controls a three phase pump on time basis and on sensor basis . It can operate two pumps. 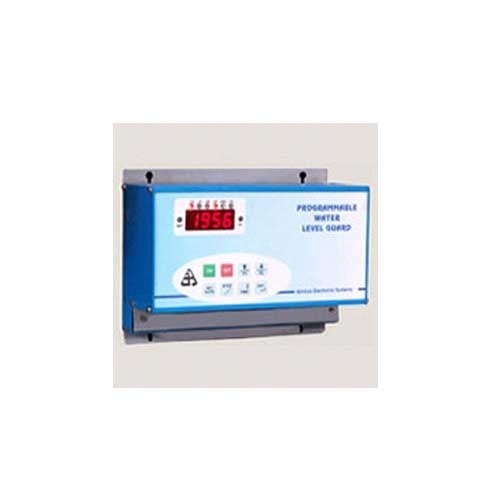 We deal in qualitative electronic programmable Water Level Controller or water level guard which is an advance instrument that control water pumps. It controls the pump as per levels in the underground and overhead tanks. It also protects the pump from power fluctuations. It is a novel and fitting solution for all your Water Problems. These water level controllers have provision to switch on the pump automatically as per time set. As an add-on feature, one time dependent switch is provided so that the common society lights can be controlled from the same unit. These water level indicators indicates status of water in tank. It gives alarm on high and low status. Ajinkya Electronic Systems Manufactures water level controller with timers These controllers controls the operation of pump as per programmed time. Facility to set on time and off time for pump is available.